If you said yes to more than one of the above, you’re probably a light worker – a soul who has a mandate for spiritual service. If you’re a lightworker, your purpose will inevitably be some variant on this theme: to serve others; to contribute something good to this world; to raise consciousness. So, the ‘why’ of your purpose is simple. Where more lightworkers get stuck is in finding the ‘how’ of their purpose. How are you going to contribute and be of service? Where do you go from realizing your purpose to actually putting that purpose into practice? To identify the ‘How’ of purpose, you first have to understand the nature of purpose. My guides constantly point out to me that we are fulfilling our soul’s purpose just by being here and being who we are. In readings, when I ask about purpose, my guides rarely give me a task to complete. Instead, they often give a set of qualities or attributes that you’re here to be. This is not usually a task – it’s something that is entirely natural to you because it’s who you are. We underestimate what we can achieve and heal just by being ourselves. Like the proverbial ripples on a lake, every action we take and every word we say has consequences. A friend recently told me a story. On the anniversary of her daughter’s death, she was visiting her daughter’s grave in the cemetery to put flowers on it. She had parked her car in a spot that was easy to get out of, on a tiny country road, but when she returned to her car, she had been trapped into that space by two other cars, one behind her and one in front of her. Getting out of that space looked impossible. By the time she had eventually got out of the parking spot, she realized that there was no way she could turn round and she had effectively trapped herself in the road. The only way she could turn round was in someone’s drive, which had a locked gate. She was trapped in. She began to panic. The emotions of sadness and grief began to overwhelm her. She was wondering what to do. Then she saw the occupant of the gated house coming down her drive and opening the gate. My friend got out of her car to thank her and as she did, the stranger gave her a hug and held her for a moment. She began to cry and was overcome with gratitude at the kindness this stranger had shown her. We don’t have to think ‘how am I going to do good today?’. As Byron Katie says ‘when you see suffering, love moves into action through you’. You do good because it’s in your nature. Ask yourself: what is special about you? What energies do you bring into this world, just by virtue of being you? Unless you’re lucky and just fall into it, to find your calling, you have to know yourself. Having a calling is about taking what you love to BE in your life and finding the most natural continuation of that which financially remunerates you. So ask yourself: What do you long to bring to the lives of others? – healing? Nurturing? Supporting? Honesty? Courage? Compassion? Leadership? – This can be a difficult question to answer because it means you have to go inside of yourself and connect with your heart – something many of us aren’t used to doing. Pay attention to how the answer comes when you ask this question as it will surely be your Higher Self (your soul) that communicates with you. What are you already being in your personal life that you love? The interesting thing about this is that you are often already expressing, or at least LONGING to express these defining energies, in your personal life. Take a good look at your personal life and listen to your friends and family. What do they really appreciate about you? What do they feel is fundamental to you? Before I became a healer, I brought the energies of healing into many of my personal relationships. I dated men whom I could help and heal and attracted friends who needed my help. I so wanted to express these energies in my life and that was the only way I had found to do that. In the end, my desire to express these energies was so strong that I attracted a career that was a good fit for channeling my healing energies. But before I could be in the place where I could attract the right career for me, I first had to identify my passion and my talents and see where they were already at work in my life. Finding your calling does not have to be a fruitless, frustrating task. Even if there isn’t a career that seems like a good fit for you at the moment, don’t despair. Sometimes we have to do a little inner work before we can get there. 2. How can I be more of what I am, in my personal life? Around friends and family? With strangers? How can I most naturally bring what is special about me to the lives of others? Another way to identify who you love to be is by looking at your previous jobs and the job you’re doing now. Why did you like your jobs in the past? What did they allow you to be and do that made you feel alive? For example, before I trained in healing, I was a teacher. I loved teaching because it allowed me to impart information and raise consciousness. I loved to help others grow and develop themselves. In fact, that was the only reason I was in teaching! What if you’ve never had a job that you liked, ever? If you don’t know what your passion is, then you might need to explore a little. Try out some new things – some new hobbies, some new jobs. Notice when you’re enjoying yourself. Think about why. Ask yourself – what is this allowing me to be and do that I love being and doing? If your calling is a mission of being yourself and expressing that which is fundamental about you, it follows that self-acceptance is essential. If on any level you are repressing who you are and not saying yes to yourself, you’re not in a place where you’re seeing that you have value to contribute. You probably won’t see what that value is. It’s impossible to attract your perfect career from that place. Only when you have self-acceptance and self-esteem can you find your calling. Naturally, you aren’t going to attract an outlet that allows you to express more of who you are if you aren’t already being yourself. But once you align with your authentic self, you begin to attract activities and people who are more aligned with your real self, in personal life, in leisure time, in friendships. This puts you in a very powerful position to attract your dream career. Occasionally a person can be so alienated from himself and his values that he has gradually lost that inner compass which tells him what aligns with who he really is and what doesn’t. And so he ends up ignoring his spirit and doing something just because others say he should. To get back in touch with your purpose, sometimes you have to shed everything we’ve been taught about what you’re here to do and be and get back in touch with yourself and what you really want. Actively cultivate a connection with your Higher self, who knows who you are. Like most people you may have a collection of limiting beliefs that follow the refrain ‘you can’t be your true self, stay true to your values and do what you like doing – it won’t pay the bills’. Once you understand who you are and what you’re here to be and do, seek a calling that aligns with your passion and gifts and don’t compromise. So, to summarize, you can begin to attract the right calling when you know who you are, accept and value who you are, and are committed to being that. Attracting your calling is relatively easy to do from a place of self-acceptance and self-esteem. You draw the activities and people towards you which allow you to creatively express yourself. If you’re not in that place of self-acceptance and self-knowledge, aim for that instead right now. Ask yourself: Who or what is preventing me from being my true self? What do I wish I could be? What do I and others feel is unique about me? How can I express myself further in small ways, personally and professionally? How can I hold true to my values more? The most important thing to know is this: You are the way you are for a reason. You were born to be you and creatively share yourself with the world. Anna, this is just what I needed to hear today. Thank you! Hi Byteful, Glad I could help! You Rock Anna! Reading your wise words throughout your website is food for the heart & soul! Thank you for being you, sharing your gifts and being a grand gem of insight and remembrance on the journey of life! This is a great post, thanks for writing it. A way I’ve found of discovering your mission is to look at what you love to do. If love flows through you while you are doing it will reflect out to others, who will feel the benefit of your efforts. Do what you love, love what you do. More importantly, I realise that the following belief ‘it?s actually impossible to be yourself and get paid for it’ is ingrained quite strongly in me, as it probably is in others. I also feel like the jobs I would enjoy don’t pay well & are not prestigious sounding ie. manager, director or something. This is something that society also ingrains in you-if you don’t have an impressive sounding title, you ‘haven’t made it’. These are some issues I need to work out. Thank you for this post, you worded it so perfectly. I have been contemplating changing directions with my career & this article has really helped me to accept what I already know is true inside. Thank you!! This article is excellent, I’m in a state of confusion as to what I’m going to do next, this has helped remove a lot of fear, taken the foot off the pedal so to speak, and it dawned on me, if I’m doing something I truly love, and bringing joy to someone life isn’t that reward enough, we are so attuned to financial needs and wants that it’s easy to lose sight of ‘what is it I want to do’ and ‘who am I’…. instead of tuning into what is truly rewarding first and foremost and allowing the universe to take care of the financial aspects, which will no doubt follow when we are being true to our higher purpose, a fab article, one I will share with others 🙂 thanks! This article is fantastic. I’ve been thinking about finding my calling a lot recently, having realised that my purpose is to teach and to heal in this lifetime, but not being able to get too much clarity beyond that. This article’s provided me with some thoughts and questions to ponder and journal about, which is exactly what I was looking for. I know this is an older post I am commenting on, but it is a timeless gem. Thanks for this. Like you said a mission of a light worker is not necessary a mission of doing,but being. My wake up call came to me in the most natural way,when i wrote a message to a friend who was on the road to recovery and she messaged me back and said,That is one of the most beautiful messages i have ever received”. I was so touched by her comment,that i knew my words in which i beleive are from Angels,have helped her feel happy,hence making my feel happy in such a way i can’t describe,only feel !! This meant a lot me! 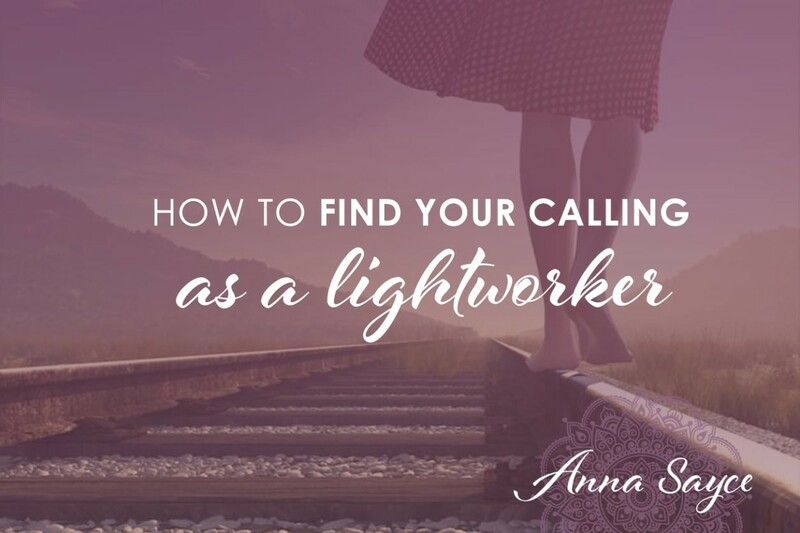 From graphic designer, to dancer, to creative arts therapist, to training in clairvoyance & healing… I still find myself struggling to find my calling as a light worker. What I’ve realized is that it’s a calling I must completely create by myself. SO ACCEPTANCE IS PARAMOUNT! I’ve made a promise to myself to stop training for at least one year and begin producing, exploring, sharing my own ideas. It’s time to trust my own creations and enjoy the pleasure of creating, playing, and intuiting. This IS my calling for now. THANKS! Hey Anna just what i needed. Seems i have quite some inner work to do to build my self acceptance, self esteem and self love. I do indeed struggle with career and finances for almost a decade now and it become quite exhausting. Thank you so much , I have absolutely been going insane in trying to understand what has been going on with me !! I feel a complete peace now. Hi, thanks for this blog. This is exactly where I am in my life right now. I’m trying to find out about my calling as a lightworker, I’m trying to find a job that makes me happy. I feel so misunderstood by my family. They are so strict on me & even forced me into a career that I hate & everything just fell apart. My life is a mess at the moment, I’m picking up the pieces & trying to find my real purpose in life. Thanks all the questions & advice is really helpful. And I believe that it will help me on my spiritual journey. Thank you Anna. Two years ago I hit a rock bottom in my life that forced me to reevaluate my choices and my path. Since then I’ve slowly been rebuilding my self-love and self-esteem. After a Lakota Indian cleansing ceremony my grandmother, who is my soulmate, reappeared to me as a crow and she follows me everywhere, providing comfort and support. A few months ago 11:11 started appearing on a regular basis, enough that I started to tune in and pay attention. Right now I’m sitting in Budapest Hungary as part of a 2.5 month personal/spiritual journey. 9:11 and 999 have begun to appear with startling regularity (even the wifi code at the cafe had 999 in it). I feel so tuned into everything around me right now and I’m not sure what to do with it. I’m not sure where to take these feelings or how to apply them to the next stage of my life. I want nothing more than to help heal people in the way I’ve healed myself (a continual journey, but one that is getting much easier). I have never fit into traditional hierarchical structures and as such am not sure where to go from here. All I can do is trust that I’m on the right path and that I will arrive at my true calling and hope that I will he tuned in enough to recognize it when it arrives. I visited with a spirit medium today for the first time and it was beautiful. Better than I could’ve ever expected. She mentioned to me that I was a very old soul, genuine, and that I was a light worker. Very intuitive. I’m unsure of where to go from here. I want to explore this gift. Any helpful guidance?